There are now a couple of Korean-based cryptocurrency websites today! This is because BTC is spreading like a virus and South Korea is one of the countries that are getting hit by it. The huge trading traffic from the region has attracted investors and companies to create their own exchange system. Today, we will be looking into Coinone.co.kr features, how to create an account, and the crypto they trade. Without further delay, let’s talk about that! One thing that we would like to comment on Korean exchange websites is that they love account tiers! We’ve literally seen a lot of exchange websites, but when it comes to Korean ones, they have a crazy amount of account tiers. Usual exchange websites that have this feature often have only 1 to 3 levels of an account, Coinone.co.kr have 9 levels! To create an account, we need to head on to their website and click on “Register” found on the upper right-hand side of the website. They will ask for your active email address, password for your new account, and do a really fun CAPTCHA game before clicking on register. Once the confirmation link has been sent to your email, just click on that and you will be redirected to the website again. The security verification is a long process and we were just only able to verify our email since the next step required a domestic phone to pass. The first step is the email verification, second would be the phone verification, followed by the Identity verification wherein photos of your identification needs to be forwarded to them. After validating your identity, they will then ask for your bank verification (this is providing bank details), then last but not the least is their OTP verification. 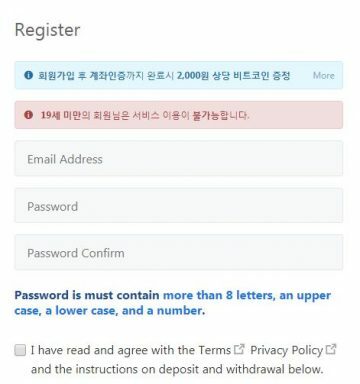 Two-Factor authentication is available here at Coinone.co.kr, which is not surprising since the second requirement to get your account verified is an active mobile number. What we found interesting is not their ability to translate Korean to English with just one click, but their ability to be a multi-sig wallet as well. Yes, you read that right. The website is not just an exchange platform, but doubles as a wallet too! We would like to thank Coinone.co.kr for giving us the chance to look into their trading platform even without finishing the account verification process. You would understand what we mean by that if you guys have been creating reviews for different exchange websites. There are exchange websites that would not definitely let you in their platform without completing the account verification process! Especially websites that is region-locked. Region-locked websites tend to lock foreigners from even looking at their trading platform by asking for local phone numbers and without the number say goodbye to the trading platform preview. Shown in the screenshot are the important parts of their trading platform. On the uppermost part of the platform is the list of crypto that their users are able to trade with. Moving to the right side are the cryptocurrencies that have margin trading. They have more than a couple of tradable coins but only BTC, ETH, and ETC is available for margin trading. Located on the far right corner of the page is the live order book where different cryptocurrencies are listed with their recent activities. Below the live order book tab, we’ve got the membership level panel. Here users are able to see their membership level and their current maker/taker fees. And below that is their live chat feature where all members are able to chat. The available crypto that is being traded on this website is namely BTC, BCH, ETH, ETC, XRP, QTUM, LTC, IOTA, and BTG. 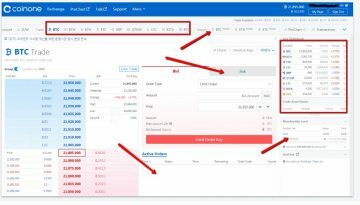 Just like any Korean exchange website, Coinone.co.kr exceeded our expectations and provided a trading platform that is not flashy but provides the same function-ability that its western counterparts have. They go for simplicity, which might be boring at times, but is perfect for those long-hours-in –front-of-the-computer trades. Depending on the amount of KRW that has been traded within a month, the maker and taker fee varies from 0.1% down to 0.02% for makers and 0.1% to 0.06% for takers. Please be advised that the more you have traded the lesser fees you need to pay. 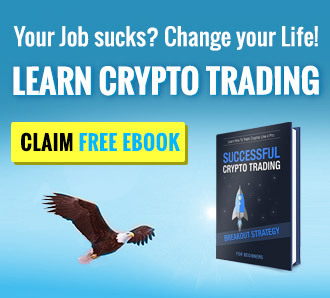 This monthly trade amount scheme is great since it promotes liquidity in the website and attracts traders that love to trade in huge amounts. Margin trade is at 0.15% for all levels of accounts for both taker and maker. To read more about the detailed fee schedules, please click this link. Here at Coinone.co.kr, they accept both Fiat and Crypto deposits. They only accept KRW from local South Korean banks, which is hard for people outside the country to create an account with them. On the other hand, cryptocurrency can be deposited and withdrawn without any problems, but account verification requirements hinder this from happening. Since the website is not fully translatable to English, we were unable to locate their deposit and withdrawal fees. If you guys have any idea on how much would it cost to transfer funds in and out of the website, please do let us know in the comments section below. We have always considered customer service an important part of a website especially when it comes to exchanges because they handle people’s money. This is just our opinion, but we honestly think that the greatest support that a website can offer would be their phone services. Here at Coinone.co.kr you can reach them by phone number 1670-9756 or send them an email directly at support.coinone.co.kr if the phone lines are busy. Our overall reaction to this website was just awesome! Collectively, we thought that this website is completely under-rated compared to other western exchange websites out there today. Coinone.co.kr is great for people that are living in the region. We love how their trading platform is designed, and the only thing we hate about them is that they are not yet open for people living outside South Korea. But even if that was said, we still think that the website is great and that we urge you to try them out if you guys have a chance!